Out of sight and out of mind is a common expression which applies perfectly to a drainage system – so much so that the location and connections of many underground pipes are a real mystery. That is why drainage engineers at Lanes Group plc are often called upon to investigate and trace sewers, drains and culverts even before planned drainage maintenance can be considered. 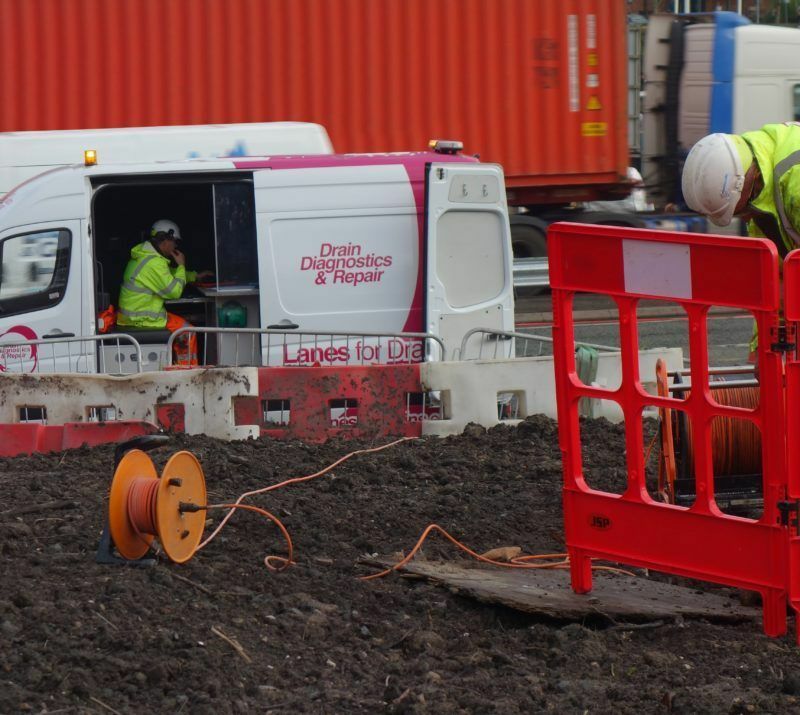 The drainage specialist’s subterranean investigation skills are regularly called upon to support groundworks and construction contractors in connection with new building or redevelopment projects. For example, drainage engineers from the Lanes Birmingham depot were called in to trace a culvert alongside the M54 motorway in Telford after a new pedestrian bridge was built. Mark Niland, Area Development Manager for the Lanes Birmingham depot, said: “Either a client will have some evidence that a culvert of drain might be located on their development site. Contractors ignore the chance of there being hidden drains at their peril. They may undermine the structures being built. Inadvertently covering and damaging water utility pipes is likely to be a costly mistake. It is understandable that drainage systems installed many years into the past can lay hidden, awaiting discovery. However, even relatively modern systems can also be much of a mystery. Mark Niland explained: “Even until recently, the keeping and updating of drainage records, in many cases, has not been consistent. The culvert along the M54 is a case in point. Contractors needed to be sure that the bridge foundations did not affect the culvert. The drainage survey report was needed as part of the asset handover process. Lanes drainage and professional services teams use a range of techniques to locate, investigate and accurately map drainage systems. The first rule is often not to trust the plans, if there is the luxury of having them. They may miss out drains already in the ground when they were drawn. They may represent a proposed system, not what actually went into the ground. They may have not been updated to include subsequent drainage development. Because of that, the first step is often a lot of basic drain detective work, walking the site, and using technical knowledge and experience to find manholes, which can turn up in the oddest places. Manholes are often buried or lost in undergrowth. Then, comes the task of identifying how the drainage system connects up, where the water flows to and from, and where the drainage outfalls are located. Alongside the legwork, Lanes can deploy sophisticated drainage survey equipment to trace underground pipes, map their connections, assess their condition, and now pinpoint them in space to within a few millimetres. Its teams use robotic CCTV drainage survey cameras to rove up and down culverts from 300mm to 1500mm in diameter and above, recording HD quality video footage as they go. For smaller diameter drains and sewers, flexible rod CCTV camera can be used. A sonde can be attached to camera heads, which can be detective from above ground, to identify the precise path and depth of a pipe. Lanes Professional Services can also use GPS and GIS mapping to prepare a highly-accurate map of drainage systems, rich with data to help analyse its condition and capability. Until then, the Lanes drain detectives will be kept busy. Combining experience and intuition, with the latest asset mapping technology to uncover the hidden sewer secrets beneath our feet.